A dropdown that permits multiple responses. 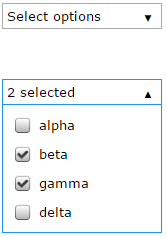 A checkbox-type select question that places all checkboxes inside a simple dropdown. Lines 99-104 of the footer can be updated with the text to be displayed in the main dropdown element.